These especially lightweight overshoes feature an abrasion-proof Kevlar sole that is resistant to even the most extreme wear. With GORE-TEX® technology, these overshoes are waterproof and windproof, yet they still breathe, ensuring warm feet. 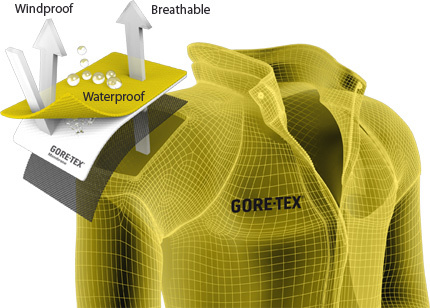 The secret of GORE-TEX products lies within the revolutionary bi-component membrane; both completely waterproof and completely breathable at the same time. The membrane contains over 9 billion microscopic pores which are approximately 20,000 times smaller than a drop of water, but 700 times bigger than a molecule of moisture vapour. So while water in its liquid form cannot penetrate the GORE-TEX® membrane, as moisture vapour it can easily escape. The patented GORE-TEX® membrane makes garments durably waterproof, windproof and breathable so that you stay dry and comfortable. Gore Bike Wear Road Gore-Tex Light Overshoes is rated 1.8 out of 5 by 5. Rated 2 out of 5 by HO48 from Bought for Hi Vis, Light and waterproof For my feet (size 45 cycling shoes) the sizing was completely wrong. The overshoes (45-47) were way too large and flapping all over the place. The replacements fitted much better. Several comments on how visible they were - that was great. And they certainly were light, but they very quickly developed a hole in the side when I brushed my foot against a wooden bench. Two rides later the toe cap has a quite large hole worn in it. Clearly I have put my foot down and done it, but these really are very delicate. I have quite a lot of Gore kit and have had nothing but praise, but these are not worthy of the name. Rated 3 out of 5 by stoneman from Good product but a tight fit The product looks very good and like a good build, but I feel that they only fit on cycling shoes. I don´t use special cycle shoes on my gravel bike, instead I cycle in lightweight hiking shoes. I use size 44 so I thought that I could use these overshoes in size XL (45-47). They didn´t fit over my shoes or any other shoe I had. Rated 1 out of 5 by T9sus4 from Not suitable for SPD shoes The bottom strap was right over my SPD cleats, so unable to click in. No way to change the position.